Yep, Paula and Debbie are off in Fresno, CA teaching this weekend so I thought I'd hijack the blog and do another post. This is where I have to confess that I had an entire post written and just deleted it because it was nothing more than me on my soapbox ranting about BBQ. So I decided to implement the KISS (Keep It Simple Stupid) principle, and write another post. It's still about BBQ but with less ranting. One of my very favorite styles of BBQ is Brazilian style. In Brazil, and Portuguese for that matter, it's called churrasco [pronounced shoo-HA-scoe]. 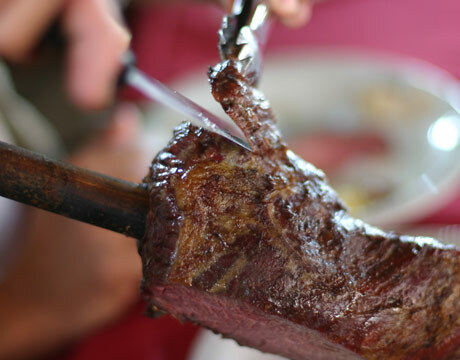 Without getting into a history lesson, let's suffice to say that the Brazilian cowboys (gauchos) started the tradition of putting big slabs of meat on, what amount to big skewers and roast them over an open fire. Brazilian BBQ restaurants, called Churrascarias, are sprouting up all over the USA and maybe many of you have been to one of them. If you get a chance, go. It is a carnivore's paradise, and there's plenty for those that don't eat meat as well. If you're not familiar, you start by loading your plate up at a very well appointed salad bar/buffet type of self serve station. It's not uncommon to have 20-30 dishes, hot and cold, to choose from. Make sure you get the traditional rice and beans. Most of the restaurants offer a price for the buffet bar only, which is plenty of food. But that's not why I go to a churrascaria, it's all about the meat. Personally, my trip to the buffet is to get rice and beans and then back to the table. This is when the fun starts. 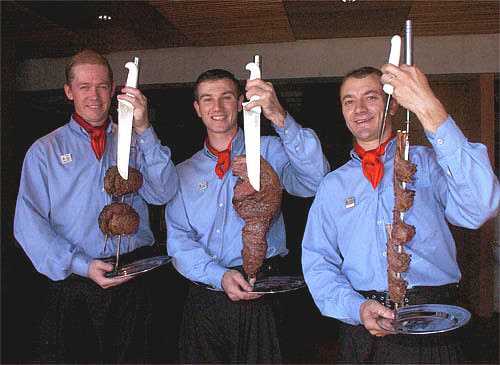 Servers, often dressed in traditional Gaucho costume, commence a parade of meat. Each one with a giant skewer with one of the 10-15 types of meats you'll be offered. If you would like some, they'll cut off as much as you want and move on. CAUTION! Don't take too much of any one type to begin, you'll want to sample them all. As you dive into the perfectly roasted and seasoned meats, the parade of meat continues. Pace yourself. CAUTION #2: Don't get more than 2 or 3 types of meat at any one time or they'll pile up and get cold before you get to them all. I've been to Brazilian BBQ restaurants (churrascarias) all over the USA and throughout Brazil. Most are very good, a few I'd never visit again, and a couple have been SPECTACULAR. One, was in the Plaza Sao Rafael Hotel in Porto Alegre in the state of Rio Grande do Sul in Brazil. 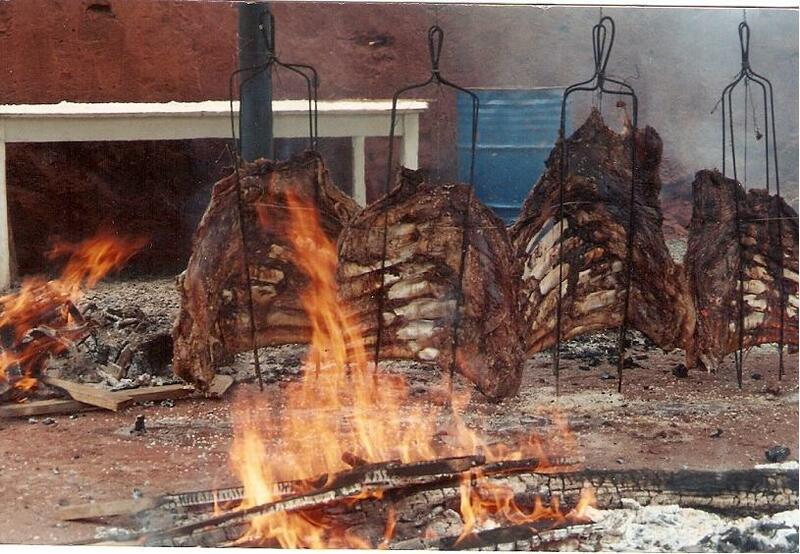 This is in southern Brazil and is where this style of BBQ originated. I ate there 26 years ago and I don't know if it even exists any more but the flavors are emblazoned in my brain. The very best has locations in Brazil and the USA. It is called Fogo de Chao (fire in the floor). I ate at the Beverly Hills location but I'm sure their other locations are as fabulous. If you've never been to a Brazilian steakhouse, search one out, most major cities in the USA have one. Go with a group of friends and you'll enjoy the experience even more. 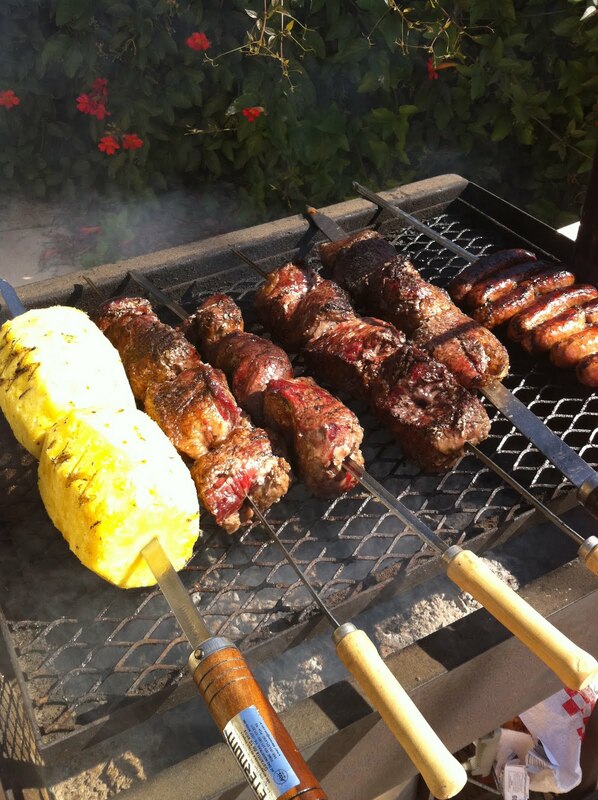 If you'd like to have a Brazilian BBQ in your own backyard, let me give you some tips. It's pretty simple and the internet is full of recipes and suggestions. But, this what I do. Here's what's different about basic Brazilian BBQ. 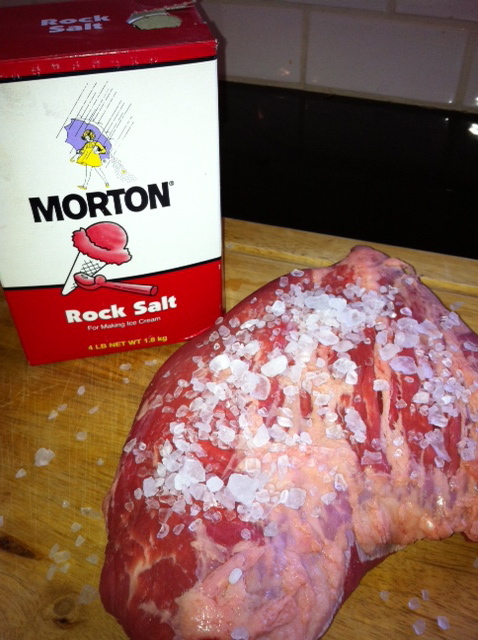 1) The traditional seasoning on beef is VERY simple...salt. That's it. In fact to be more specific ROCK SALT. Yep, that same rock salt you use in your hand-crank, homemade ice cream maker. 2) I then cut the meat it to equal size and chunks (about the size of a softball) place them on big skewers, okay they look like swords, that I bought in Brazil. Roast them over hot coals, turning frequently. There you go, it's that simple. You'll notice that I've added some linguiça and pineapple for this particular churrasco. It's common to have skewers with chicken thighs, pork loin, all sorts of cuts of beef and even lamb. There is a classic traditional Brazilian staple that I don't include, ever. First, they are hard to find and second I don't like them, and that is chicken hearts. ENJOY! Let me know your favorite Brazilian steakhouse and if you want to try it at home, I'd be willing to give you some tips. Thanks for letting me hijack the blog again. Paula will be back with her promised post on Monday probably. Cliff and I love Brazillian BBQ!! Thanks for the tips. Maybe we will try it out in our own backyard sometime. We got to Texas DeBrazil in downtown Ft Worth, Texas. Love this style of eating. Not into the lamb though. Thanks for sharing. That's a really interesting insight into a new dining opportunity and my DH's birthday is coming up. We have 2 new Brazilian restaurants here in Liverpool England which, from their websites, seem the same as you described. You have made me really want to visit them. Good luck to Paula and Debbie for their trip! This is great information. You don't have to hijack Paula's blog though. You should start your own. I agree, I love Brazilian BBQ. I usually don't get the beef (hubbie does) but I LOVE their buffet, chock full of marinated and pickled vegies, the best dressings, smoky black beans and cheese rolls. I live in Torrance,Ca so if you are ever this way, check out By Brazil on Satori Ave.
Querida Paula, em São Paulo, nos fazemos o churrasco com vários tipos de carne, mas a mais apreciada é a Picanha, gostamos também de linguiça de lombo de porco e mista. Aqui em casa fazemos alguns acompanhamentos como: salada de folhas, farrofa (uma farinha de mandioca torrada e temperada com cebola frita na manteiga e um toque doce, de uvas passas, você terá um sabor acridoce), mandioca cozida em água e sal, e um molho especial chamado de vinagrete (cebola,toate salsinha,tudo bem picado e regado com azeite um pouco de vinagre e sal), arroz branco...Este é o nosso CHURRASCO.